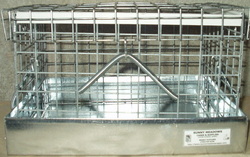 CARRIERS ARE MADE WITH STRONG 14 GAUGE 1"X1" WIRE AND COME WITH A 2 1/2" HIGH TRAY. CARRIERS THAT HAVE DIVIDERS HAVE THE OPTION OF A METAL OR WIRE DIVIDER. MAKE CUSTOM CARRIERS TO SUIT YOUR NEEDS.